REDEMPTION Premieres New Track "Thirty Silver"
On February 26th, Los Angeles prog-metal outfit REDEMPTION - featuring Nick van Dyk, Ray Alder (FATES WARNING, ENGINE), Sean Andrews and Chris Quirarte (as well as guitarist Bernie Versailles, who is presently on an indefinite medical hiatus) - will release their sixth full-length, The Art Of Loss, via Metal Blade Records worldwide! In anticipation of its release, the band has premiered a new track, "Thirty Silver" - featuring guest guitarists Chris Poland, Marty Friedman and Chris Broderick and you can check it out below. For another preview of The Art Of Loss, please visit metalblade.com/redemption to view the lyric video for the first single, "Damaged" - featuring guest guitarist Marty Friedman - and to pre-order the album. 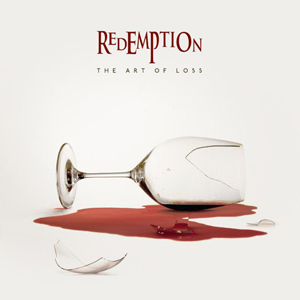 Containing over 70 minutes of their unique blend of passion, melody, aggression and complexity, The Art Of Loss was produced once again by Tommy Hansen, who worked with the band on 2009's Snowfall On Judgment Day. The cover artwork was also created by long-time REDEMPTION collaborator Travis Smith. Musically, The Art Of Loss follows its predecessor (2011's This Mortal Coil), but their newest work finds composition, musicianship and production taken up another notch, with an array of songs ranging from hard-hitting melodic metal to the 23-minute epic "At Day's End"-- plus, special guest appearances from Chris Broderick, John Bush, Marty Friedman, Simone Mularoni and Chris Poland. See below for the official track-listing!